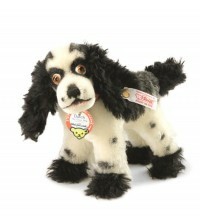 This Steiff dog is designed for the Steiff NA 2014 collection. Made out of white and black mohair. 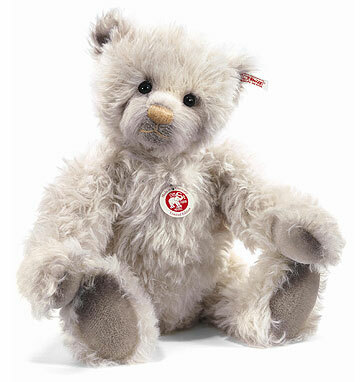 This Steiff bear is designed for the Steiff NA 2014 collection. Made out of gold colored silk plush. 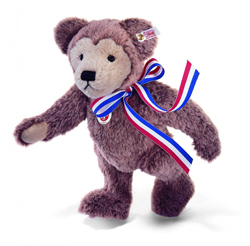 This bear is made by Steiff in 2011 as a USA limited edition. She has a Swarovski pendant around her neck. Shaggy is an USA exclusive for 2011. He is 35 cm. / 14" tall and and limited to 1.500 pieces. This wonderful bunny is made for the USA only. He is 17.5 cm. / 7" tall. The cartoon that gave the “Teddy bear” its name was illustrated by artist Clifford Berryman. Portraying a real-life historical incident in which Teddy Roosevelt refused to shoot a helpless bear cub on a hunting trip, the cartoon played a major role in starting the Teddy bear craze. The bear cub in the drawing had a unique “masked” face – mirroring a real toy bear that belonged to Berryman. 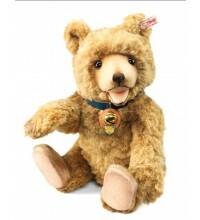 Exclusively for North America, Steiff presents a bear inspired by Mr. Berryman’s recently discovered original toy bear. This Teddy’s “masked” face makes him a real rarity. 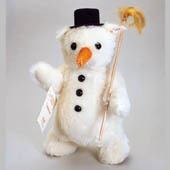 Made of tipped alpaca, he is perhaps the most distinctive bear in our 2007 collection. Size 35 cm. / 14" . 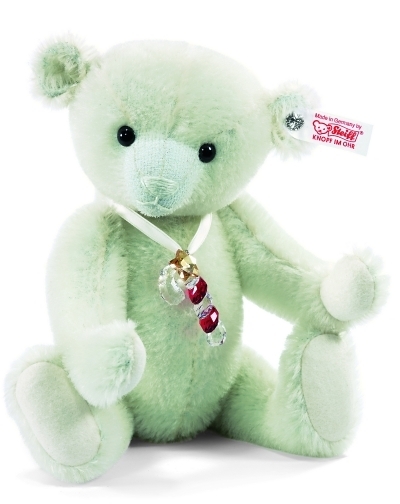 Introducing the newest addition to the series of Swarovski bears from Steiff: Poinsettia! This handsome 25 cm. 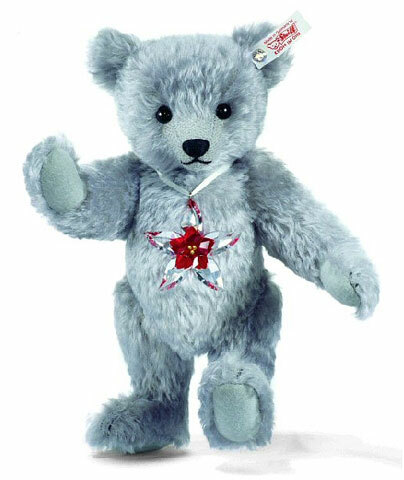 / 10" bear is lovingly handcrafted from genuine silver mohair. Celebrating the holiday season in style, a beautiful two-toned Swarovski Poinsettia ornament hangs around his neck. Poinsettia’s head is slightly tilted, adding a delicate touch. Both the bear and the ornament are new designs for 2007! Similar to all bears in the Swarovski series, a brilliant Xilion™ stone replaces the trademark gold-plated "Button in Ear." Production will be strictly limited to the year 2007. This bear is made for the celebration of the new Millennium. He is wearing a white dove medallion around his neck. The bear proclaims our hope for a new era of co-operation and love among nations. The bear is limited to 3000 pieces and 30 cm. / 11,5” tall. 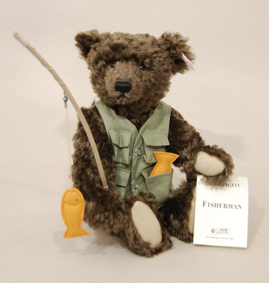 This fisherman is made for the Disney Event in 1996. It is a limited edition of 1.000 pieces and was only available at Epcot during the show. He is 33 cm. / 13" tall. He does not have a Disney pin. This bear is made from 1988 till 1990 only for the USA. He is 46 cm. / 18.5" tall. He is limited to 5.000 pieces. His bigger brother of 60 cm. /24" is issued in 1990 only for the USA to and his smaller brother (35 cm./ 14") was issued world wide. Winter is one in the 4 seasons series made for America in 1996 / 1998. He is 36 cm. / 14" tall and limited to 6.000 pieces.